I am running Ubuntu 12.04. Alt+F1 gets intercepted by Unity (I'm guessing) and highlights the Dash icon. I don't want it to do that, as I want Alt+F1 for other purposes. I have scoured google and tried everything I could find, to no avail. How can I prevent Unity from handling Alt+F1? You'll need the CompizConfig Settings Manager (which you can install via the Software Center). 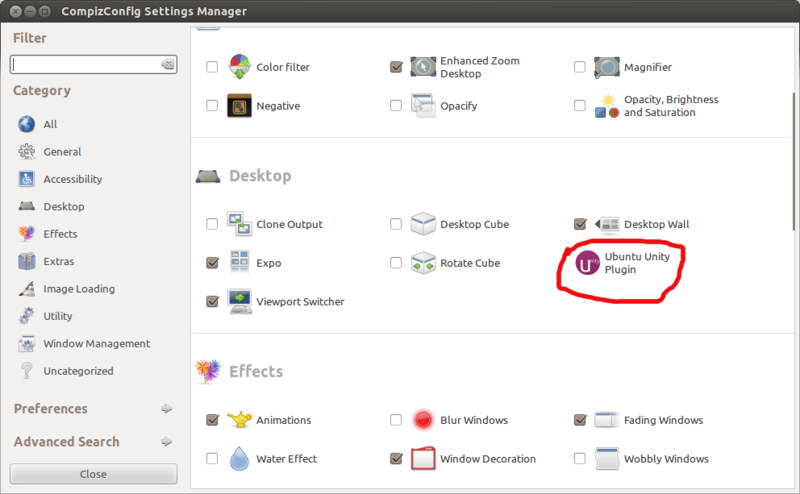 Once open, click on Ubuntu Unity Plugin (in the Desktop section). 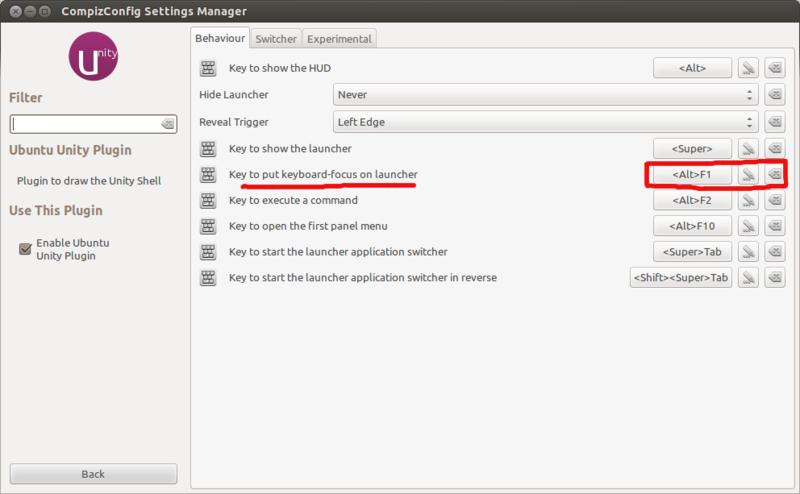 Under the Behavior tab, you'll see Key to put keyboard-focus on launcher. Simply change the keybinding there. Note that in later versions of the Unity plugin, the tabs in that plugin have changed (as the comment below by Carlton mentions). The Key to put keyboard-focus on launcher stting is now under the Launcher tab. The above answer works for me on 12.04LTS Unity 3D. If it's not working for you I wonder, are you using Unity 2D? If so you may not be able to change settings with CCSM. How to remove an icon from Unity Dash? What's the command to open the Unity Dash? How can I change the icon of an app launched from keyboard shortcut (or terminal)?